posted by Billie Owens in fire, notify, elba, news. A skidster is reportedly on fire inside a barn at 7116 Norton Road, Elba. The barn is 75 feet from a house. Elba Fire Department is responding along with Byron. Stafford is requested to stand by in quarters. The location is between Ford and Edgerton roads. UPDATE 5:08 p.m.: Fire police are requested to shut down traffic at Route 262 and Edgerton Road. Command at the scene tells responders to "take it easy coming in," due to road conditions. UPDATE 5:23 p.m.: City Engine 11 and Town of Batavia Engine 24 are on scene, too. This is now a working barn fire. UPDATE 5:28 p.m.: Fire police also requested for traffic control at the intersection of Edgerton and Norton roads, and at Batavia Elba Townline Road and Norton Road. UPDATE 6:15 p.m.: This occurred at barns owned by Torrey Farms. 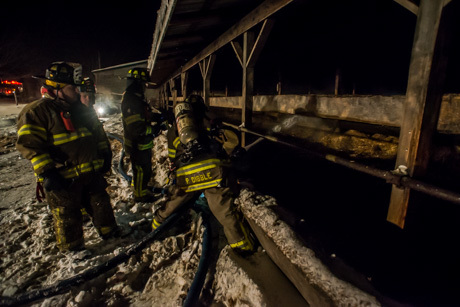 The fire did not cause structural damage to the barn. Some hay spread through the barn did catch on fire. But there were 120 cows inside and all of them were unharmed and safely evacuated. Cow trailers are being deployed to shuttle the cows to CY Farms' Heifer Farm, where they will be kept temporarily. 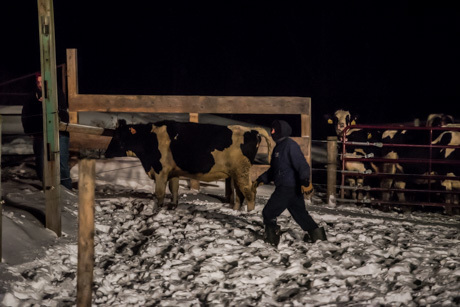 It is estimated that it will take about 10 trips to transport the cows for safekeeping. 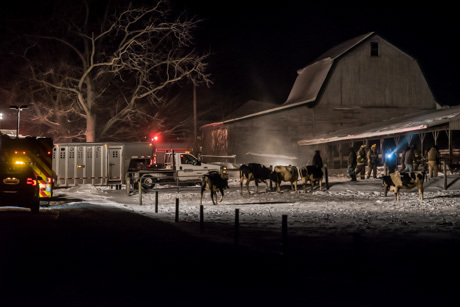 UPDATE 6:24 p.m.: Elba Fire Chief Mike Heale said the skidster fire sparked some hay but there's no significant structural damage to the barn; some top beams may be singed in places -- a later inspection can confirm that. Heale said there was no extension of the blaze. UPDATE 6:57 p.m.: Town of Batavia back in service, returning. UPDATE 7:05 p.m.: Elba back in service. Roads reopened. UPDATE 7:27 p.m.: Correction, the road is still closed. It is closed until the cows have been moved so the trucks can more safely back in. There is at least one more round trip for the trucks. posted by Howard B. Owens in sports, basketball, elba. 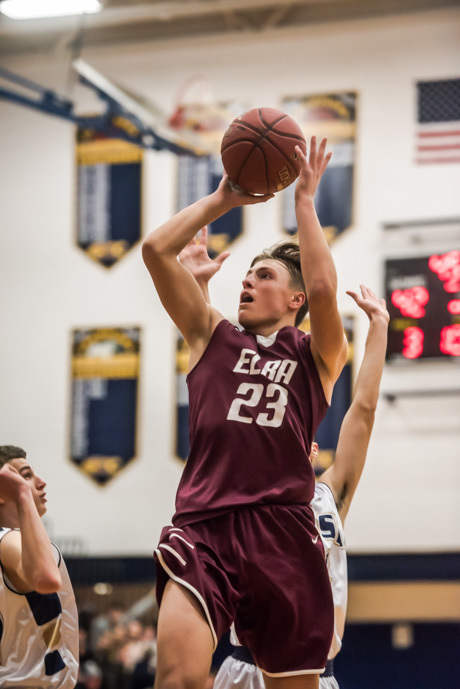 Perry beat Elba 62-45 in boys basketball Friday night. 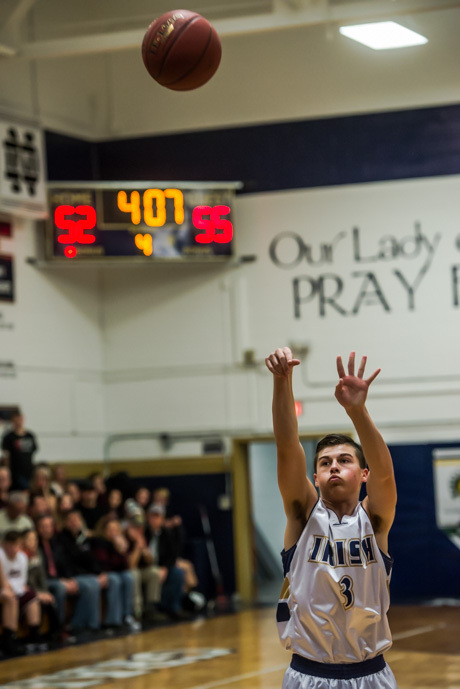 For the Yellowjackets, Tyler Cowie scored 31 points. Micheal Hockey added 12 and Austin Croll, 10. 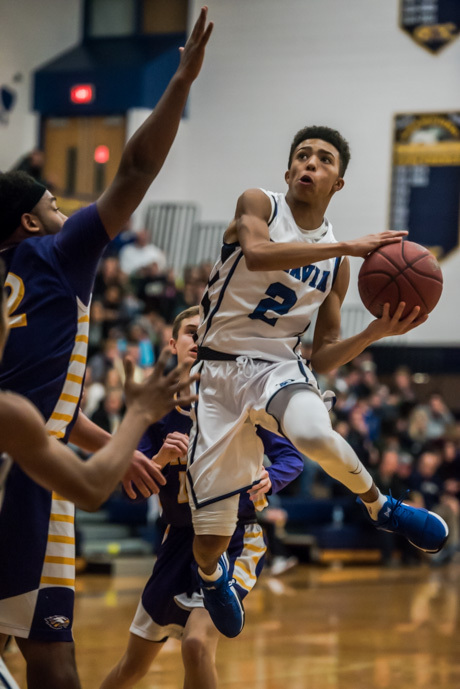 For the Lancers Jonathan Boyce scored 12 and Ben Pflaumer scored 10. Both Hockey and Pflaumer hit a trio of three-point shots. posted by Billie Owens in Announcements, GCC, fitness, Play to Get Fit Challenge, elba, batavia, Le Roy, Oakfield, Alabama, Pavilion. Congratulations to Perry Central School for winning Genesee Community College's 2017 Play to Get Fit Challenge! The Health and Physical Education department at Genesee Community College has been rewarding schools and students for their Get Fit Challenge efforts since 2011. The Play to Get Fit Program was created for third-, fourth- and fifth-graders in the GLOW (Genesee, Livingston, Orleans and Wyoming counties) region to effectively illustrate how many minutes young people spend engaged in physical activity outside of school. Children record their active minutes on a five-week calendar log specially designed for the "Play to Get Fit" challenge. Walking, biking, running, skating, swimming, playing a sport, playing tag, playing on a swing set and other active, creative games are all eligible for active "credit" minutes. However, video fitness games utilizing Wii or Xbox Kinect are not eligible. This year, the Perry Central School recorded a whopping 3,021 average active minutes based on the number of students enrolled in third, fourth and fifth grades. Last week, the school was awarded the 2017 winning plaque and each student received a certificate recognizing their participation and effort. "Play to Get Fit is a powerful way to expose kids to an active lifestyle and encourage them to have fun while being active," said Becky Dziekan, GCC's director of Health and Physical Education. "The participation from various school districts is proof that the program works! Congratulations to Perry and all of the students who participated." The Health and Physical Education program at Genesee Community College offers several areas of study. The Sports Management Studies transfer degree programs or associate of science (A.S.) program includes foundations in accounting, marketing, sports facility management and more. The Fitness and Recreation Management applied associate of science degree (A.A.S.) program offers a Personal Trainer concentration and the opportunity to earn the National Commission for Certifying Agencies (NCCA) accredited credentials through the American Council on Exercise (ACE) as a certified personal trainer. In addition, GCC offers both an A.S. and an A.A.S in Physical Education Studies in which students have the opportunity to earn a coaching certificate for NYS non-Certified Physical Education Teachers. 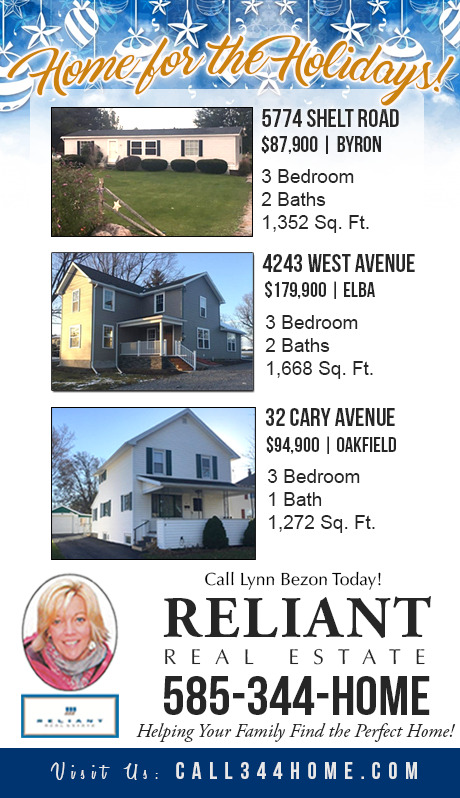 posted by Lisa Ace in Sponsored Post, advertisement, Reliant Real Estate, byron, Oakfield, elba. 5774 Shelt Road, Byron | $87,900. CLICK HERE FOR LISTING INFO. Awesome country location for this affordable 3 bedroom, 2 full bath home! Whether you are downsizing or just starting out this home fits the bill -- spacious open concept with large rooms makes this home feel large but super cozy. Located in the Elba School System this home is perfect for the people who want their piece of country. Surrounded by fields on a quiet road-definitely one to take a ride for! 4243 West Avenue, Elba | $179,900. CLICK HERE FOR LISTING INFO. Super opportunity to own this beautifully remodeled from top to bottom Country home!! Literally from the studs up this home has been done -- electrical, drywall, furnace, central air, flooring, bathrooms, kitchen, windows and siding! The layout is spacious and open with cathedral ceilings and the bedrooms are large with huge closets -- the master bedroom suite is every girl's dream! Master bedroom bath and laundry hookups all on main floor for no stairs convenience! The location is on quiet country road within five minute drive of thruway and shopping. Home has public water as well-all the pluses of Country living with amenities! Definitely one to check out-why build when you can buy this beautiful home at almost half the cost! 32 Cary Avenue, Oakfield | $94,900. CLICK HERE FOR LISTING INFO. Solid home in the heart of the village! This three bedroom home has a lot to offer either to someone starting out or a growing family. This home is super spacious with a very open floor plan downstairs and upstairs features plenty of closets and good size bedrooms. The kitchen is sunny and bright and has homey back breakfast nook out looking the fenced in back yard. There is an extra deep garage plenty big enough for a car and work space! The basement of the home with a little work could be great extra living space -- it is already partially finished and has a wet bar! The home does have central air and a new 200-amp electrical service and the roof on home and garage is 7 years young. With very little elbow grease this home can be up and running for the New Year! Very easy to see! posted by Lisa Ace in Sponsored Post, advertisement, Reliant Real Estate, real estate, elba. Super opportunity to own this beautifully remodeled, from top to bottom, country home! Literally from the studs up, this home has been done-electrical, drywall, furnace, central air, flooring, bathrooms, kitchen, windows and siding! The layout is spacious and open with cathedral ceilings and the bedrooms are large with huge closets -- the master bedroom suite is every girl's dream! Master bedroom, bath, and laundry hookups all on main floor for no stairs convenience. The location is on quiet country road within five minute drive of thruway and shopping. Home has public water as well -- all the pluses of country living with amenities! Definitely one to check out. Why build when you can buy this beautiful home at almost half the cost! 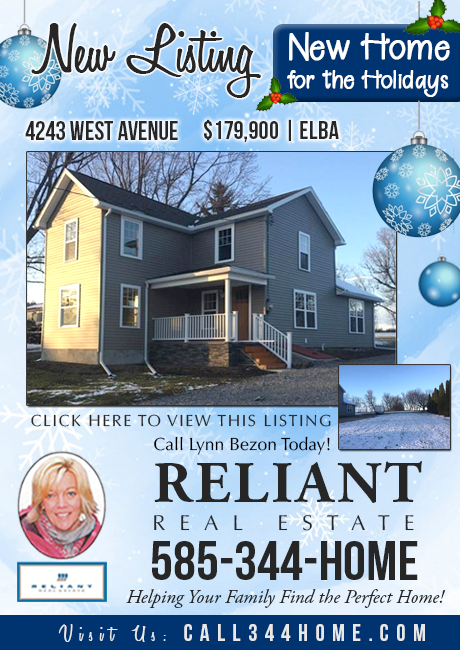 Call Lynn Bezon at Reliant Real Estate today for more information or click here to view this listing. posted by Billie Owens in elba, news. Kevin Dart would like to announce that Bingo at the Elba Fire Rec Hall is canceled tonight. posted by Billie Owens in Announcements, elba, Craft Show. Thank you, MR. Palmer, Mrs. Harris, Mrs. Cusmano, Mrs. Cronkovich, Glennda, Mr. Tower, Mrs. Stucko, Ms. Bush, Mrs. Pedro, Mrs. Kent, Mrs. Christopher, the booster clubs that showed up, all the volunteers from National Honor Society, Student Council, we could not have done it without you. Mel, I just want to let you know that you went above and beyond and w so appreciate you. Thank you again for everything you do for us. This is why I always say ELBA ROCKS….. I WOULD LIKE TO Thank the Brayden Salvaterra Memorial Foundation for bringing in the bounce house. The 50/50 raised $154.00 to be donated to this wonder foundation. The foundation gives back to the school and community in so many ways and we are grateful. Thank you to the Boy Scouts for showing what scouting is all about. I am proud to be associated with such a fine group of young men. You worked hard all day and all I heard was wonderful things about you guys. You were polite, courteous, respectful and funny at times. (yeah, I know, doesn’t sound like our boys). Thank you to Jamie Belluscio, you are awesome with the boys helping them keep on track and getting the orders to the vendors. You definitely had more patience than I. Thank you to the kitchen crew Frank, Brian and Shawn.You guys did a fantastic job considering the boys brought you 30 orders all at once hahaha. Thank you to the parents for letting us have their boys all day and thank you for instilling in them good behavior. Our scouting program would not work without your continued support. Also would like to thank Ron and Herm for setting up and all their behind the scenes work. Also, a shout out to Lauren Zuber, thank you for coming and helping set up on Friday night it was greatly appreciated. I would like to thank each and every one of the vendors that came out and supported the Elba Scouting program, without you this event would not have been possible. Thank you to all the customers/shoppers that came out and supported us and the crafter/vendors. I would also like to thank the Sheriff’s Department for coming out and fingerprinting and photographing the children. And thank you to Mr. and Mrs. Claus for surprising us with a visit. I would like to thank all our businesses that donated to our Grand Door prize which was worth well over $800. Thank you for your generosity. Thank you to Harvester 56 for letting us borrow the chairs. To My dear friend Ruth, thank you for setting up my booth and selling my baked goods all day. Luv u. And as always last but not least my Queen Kim, there are no words to explain my gratitude. I luv you to the moon and back. If I have left anyone out I am truly sorry it was an oversight, so many to thank to make this a success. posted by Howard B. Owens in accident, news, elba, notify. 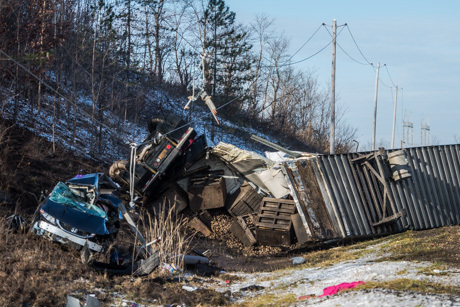 STORY UPDATED AT 5:32 p.m.
A semi-truck hauling potatoes and a passenger vehicle collided at about 1:15 p.m. today at the intersection of Lockport Road and Route 98 in Elba and as a result of the accident two people died. The victims are Franca C. Monachino, 45, of Hilton, and Jerry E. Tuttle, 29, of Kingley, Pa.
State Police investigators believe Monachnio was driving a 2013 Honda Civic westbound on Lockport Road and failed to yield at the intersection of Route 98. Tuttle, in a 2004 Peterbilt hauling potatoes, was northbound. Both vehicles went off the west shoulder of Route 98 and became entangled in high-voltage electrical lines. 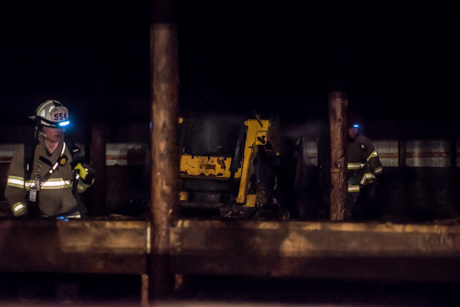 Firefighters were unable to check on the victims until National Grid arrived on the scene, about 30 minutes after the accident, and shut off power to the lines. The operators were deceased at the scene and there were no other victims. Troopers were assisted by Elba fire, Mercy EMS, Sheriff's Office, National Grid, Genesee County coroner, NYSP Commercial Enforcement Unit, NYSP Collision Reconstruction Unit and the Bureau of Criminal Investigation. posted by Howard B. Owens in elba, accident, news. 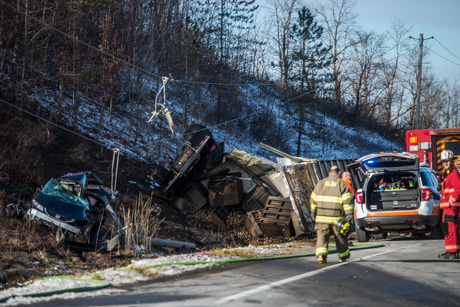 A tractor-trailer rollover accident with possible multiple vehicles involved is reported on Route 98 and Lockport Road in Elba. Power lines may be down. UPDATE(S) (By Billie) 1:56 p.m.: Route 98 is closed at Old Oak Orchard Road and Lockport Road is closed in both directions. There is a semi-truck and a passenger vehicle involved and they are entangled in power lines. The roadways will be closed for an extended period of time. 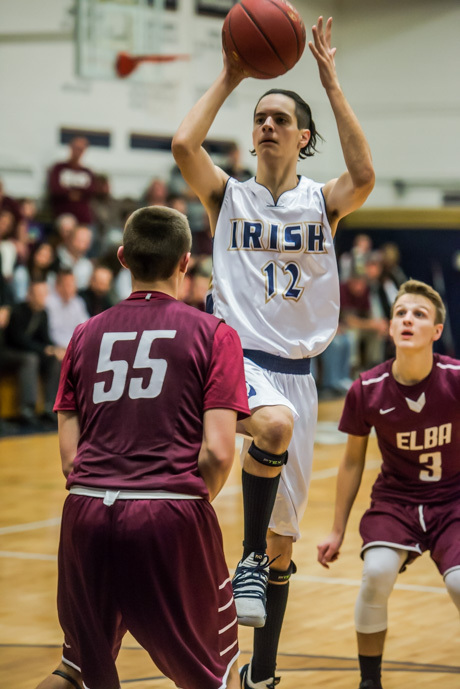 posted by Howard B. Owens in Notre Dame, elba, basketball, sports. 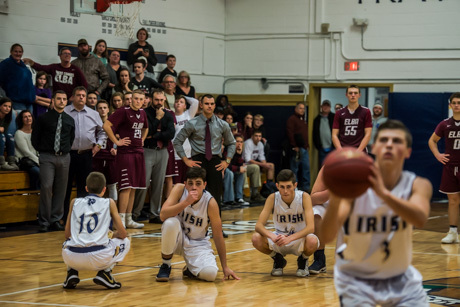 Fans of the Notre Dame, Elba rivalry got their money's worth Friday night as the boys' basketball teams battled into overtime Friday night before the Fighting Irish came out on top 74-72. 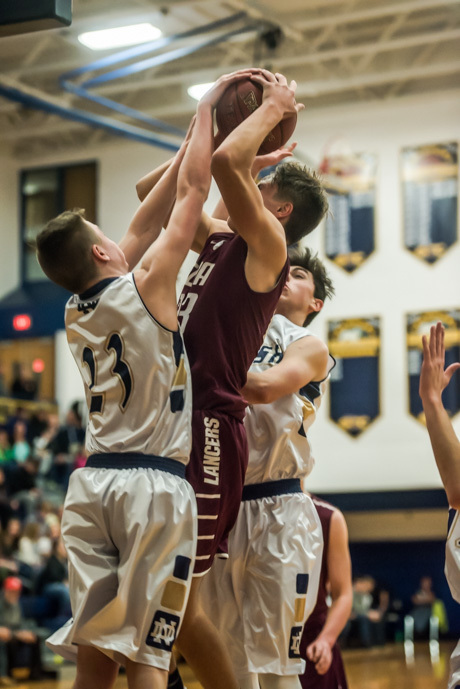 The Lancers went into the final 15 seconds of regulation with a four-point lead but a three-point bucket by Andrew Moore (top photo) narrowed the lead to one. 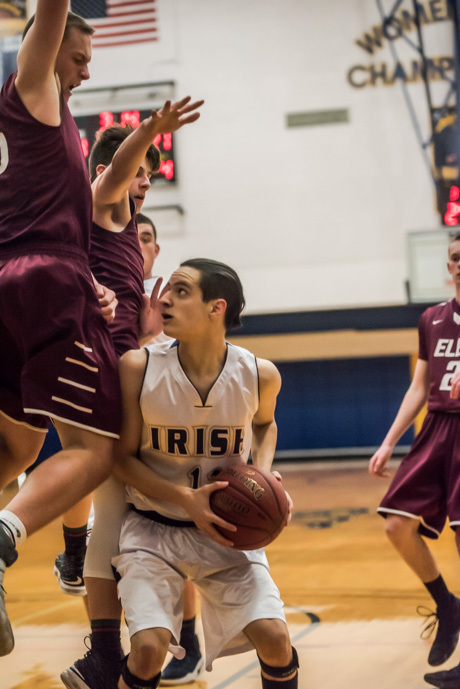 Elba failed to score on its possession and the Irish got the ball back with a little more than five seconds on the clock. 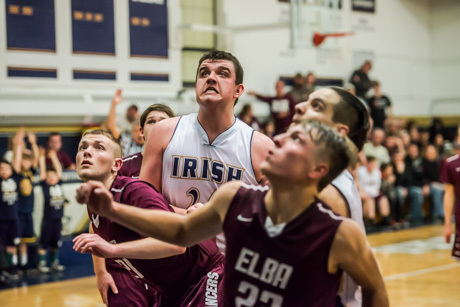 Notre Dame's Gabe Macdonald was fouled as he drove in the lane toward the basket as time expired. He was also injured, so Zachary Cocking was called on to shoot his free throws. Cocking made the first to tie the score but missed the second (second from bottom photo) to send the game into overtime. 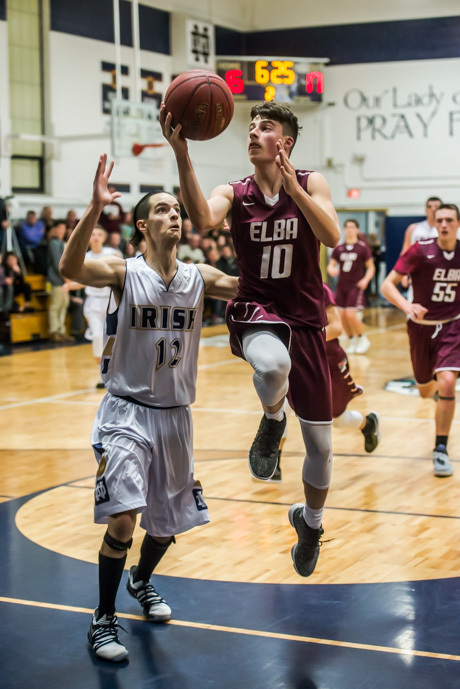 "They showed they have a lot of heart," said Head Coach Mike Rapone after the game. "They have a lot of courage. They didn’t give up. We not only played without (Ryan) Moffett (due to injury), but Nico (Zambito) had fouled out so the kids just circled the wagons and just keep battling. They hit some big shots and they never gave up." Zambito was the game's top scorer with 26 points. He hit six three-pointers. 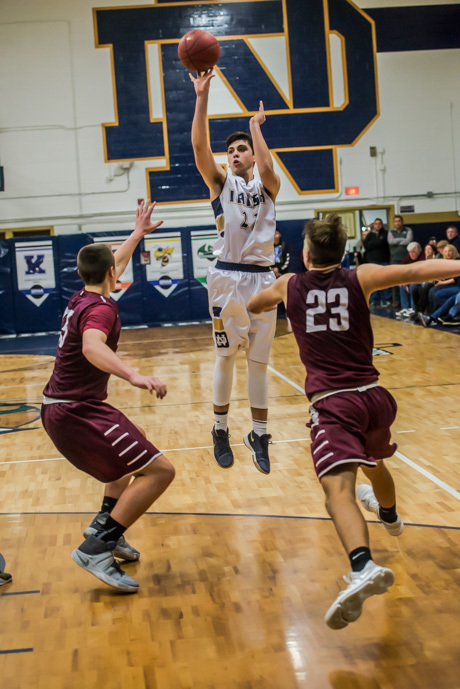 Spencer Misiti had 14 points, with four three-pointers. 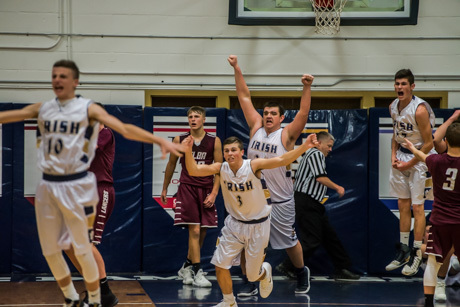 Keith Szczepanski, Notre Dame's 6'7", 305-pound sophomore forward, scored 13 points, including four points in overtime. 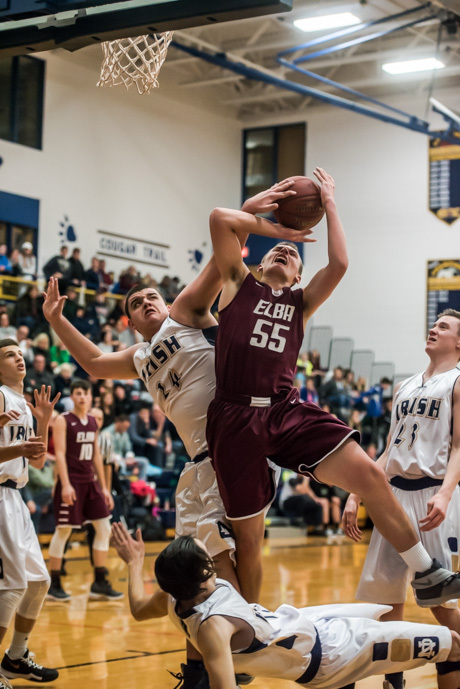 For Elba, Colton Dillon scored 23 points. He hit five shots outside the arch. 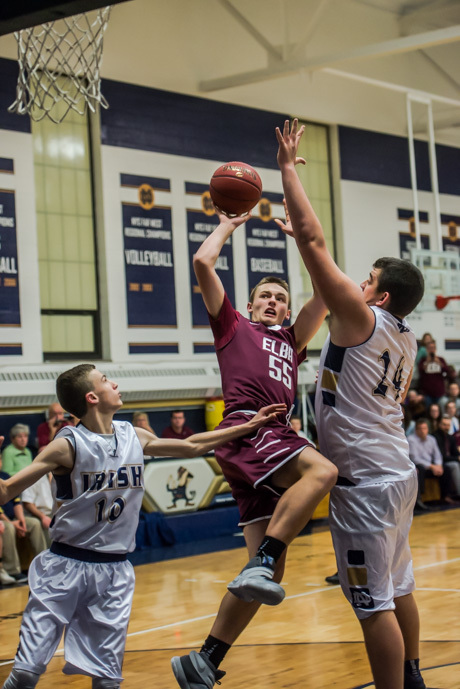 Collin O'Halloran scored 15, including a pair of threes. Grayson Huntington scored 11, including two threes. Jonathan Boyce added 10 points. posted by Howard B. Owens in job development board, Job Bureau, batava, elba, news. 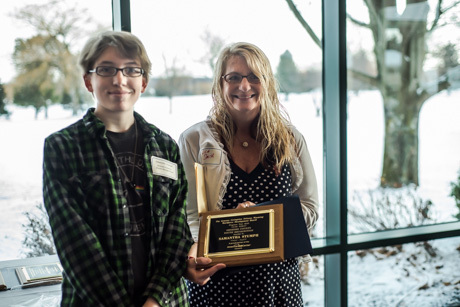 CY Farms was named Business of the Year for Genesee County by the GLOW Workforce Development Board at a breakfast this morning at Terry Hills. The Elba-based company was honored by for its contributions to agriculture, the local business community and employee development. Founded in 1951 by Carl Yunker, the farm has grown from 25 cows and a tractor to more than 6,000 acres of crops, 3,800 dairy replacement cattle, and Batavia Turf. CY Farms supports numerous community activities and has hosted job development tours and education programs. The company was also honored because one of its employees is a man with disabilities that the Yunkers worked with to help tailor a job to suit his needs. 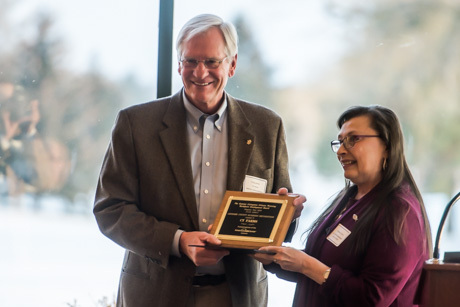 "The man is now able to support his family," said Veronica Frost during the presentation of the award to CEO Craig Yunker. 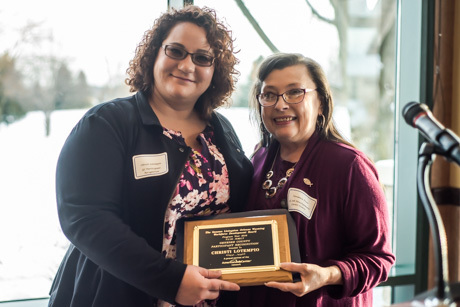 Christi Lotempio was named Participant of the Year for Genesee County. Frost also presented this award. Lotempio was laid off by Muller Quaker and when she entered the job bureau she had no college education experience. She enrolled at Genesee Community College and completed a two-year degree in 18 months with a major in Business. She also studied Accounting. She graduated with a 3.94 GPA despite big changes in her life -- being forced to move because the home she was renting got sold; her uncle died; she was in a car wreck; and she got married. Now she's employed at Genesee Lumber. Lisa Smith presented Samantha Strumph with the Youth Recognition Award. Smith described Samantha as quiet and shy when she first entered the Job Bureau in Batavia. Now, she said, she's bursting with confidence after working at the Byron-Bergen Library. 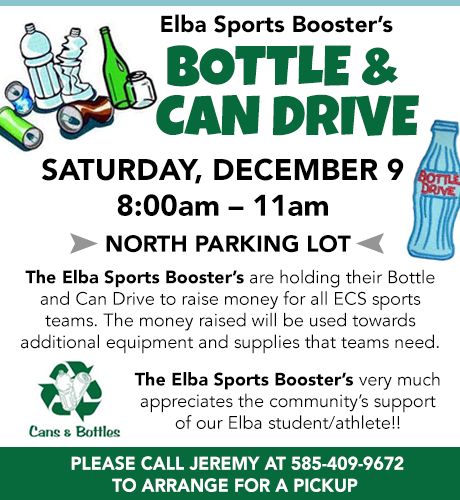 posted by Lisa Ace in Sponsored Post, advertisement, Elba Sports Booters, Bottle and can drive, fundraiser, Elba Sports, elba. posted by Billie Owens in firefighters, alexander, Bethany, corfu, Stafford, elba, pembroke, darien center, batavia, Pavilion, south byron. Fifteen area firefighers successfully completed the Basic Exterior Firefighter Operations (BEFO) training program held at the Genesee County Fire Training Center. Also, an eight-hour Trench Rescue Awareness course was recently conducted at the Genesee County Fire Training Center. Twenty-two members of the County’s volunteer fire service completed this program on Nov. 9. BEFO is an entry-level program requiring 79 hours of classroom instruction and skill development. This course is designed to prepare students to respond to emergencies as exterior firefighters. BEFO prepares new firefighters to operate under direct supervision in the exterior or IDLH (immediately dangerous to life or health) areas of the fire scene. Students participated in training covering: firefighter personal protective equipment (PPE); self-contained breathing apparatus inspection and cylinder changing; fire department communications; building construction and fire behavior; modern fire control research; portable fire extinguishers; rope and knot tying; ground ladders; forcible entry; tactical ventilation theory; water supply; hose and fire streams; loss control; orientation to fire origin and cause determination; fire prevention and life safety initiatives; confined space awareness; overview of first aid and buddy care; and Hazardous Materials First Responder Operations. Problems that can and do occur in trench rescue incidents were discussed. Safety techniques, shoring techniques, proper procedures, team operations and hazard assessment were addressed. Corfu Rescue Hook & Ladder Co.
Darien Center Chemical Fire Company inc.
posted by Howard B. Owens in crime, news, Oakfield, batavia, notify, Le Roy, elba, pembroke, Alabama, bergen. Michael Alan Shetler, 27, of Judge Road, Oakfield, is charged with two counts of second-degree strangulation, five counts of criminal obstruction of breathing, two counts of third-degree assault, unlawful imprisonment, 2nd, and two counts of criminal mischief, 4th. Shetler was arrested following an investigation by Deputy Kevin Forsyth and Deputy Richard Schildwaster into several complaints of domestic violence at a location on Main Street, Oakfield. Shetler was also charged with endangering the welfare of a child. He was jailed on $5,000 bail. Nicole Leanne Williams, 25, of Kings Street, Albion, is charged with DWI, driving with a BAC of .08 or greater, and driving left of pavement markings. Williams was stopped at 2:45 a.m. Sunday on Quaker Hill Road, Elba, by Deputy Howard Wilson. Amy R. Sellhorst, 31, of Beaufort Street, Rochester, is charged with harassment, 2nd. Sellhorst is accused of hitting another person at a location on York Road, Le Roy, at 10:37 p.m. on Saturday. Jason William Wolf, 41, of West Main Street Road, Batavia, is charged with felony DWI, felony driving with a BAC of .08 or greater, aggravated unlicensed operation, 1st, driving a vehicle without an interlock device, and improper left turn. Wolf was stopped at 8:23 p.m. Thursday on West Main Street Road, Batavia, by Deputy Richard Schildwaster. Jaclyn Kathryn Blackmer, 32, of Cabot Road, Rochester, is charged with DWI, driving with a BAC of .08 or greater, open container, driving left of pavement markings, and moved from lane unsafely. Blackmer was stopped at 2:33 a.m. Saturday on Main Road, Pembroke by Deputy Mathew Clor. Joseph M. Smith, 41, of State Street, Batavia, was arrested on a warrant. Smith posted bail and was released. Alaysia L. Henderson, 18, of Gardiner Avenue, Rochester, was arrested on a warrant for alleged failure to appear. Henderson was released on $500 bail. Christina R. Aaron, 21, of Rochester, is charged with unlawful possession of marijuana and speeding. Aaron was stopped by State Police at 11:51 p.m. Friday on Route 33, Bergen. Heather M. Captain, 31, of Basom, is charged with harassment, 2nd. Captain was arrested by State Police in relation to an incident reported at 8:35 p.m. Aug. 27 in the Town of Alabama. No further details released. Crystal D. Cardona, 27, of Bergen, is charged with unlawful possession of marijuana. Cardona was stopped by State Police at 1:55 p.m. Nov. 7 on Route 33, Bergen. 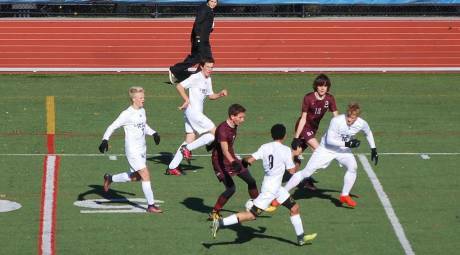 posted by Howard B. Owens in byron-bergen, elba, sports, soccer. 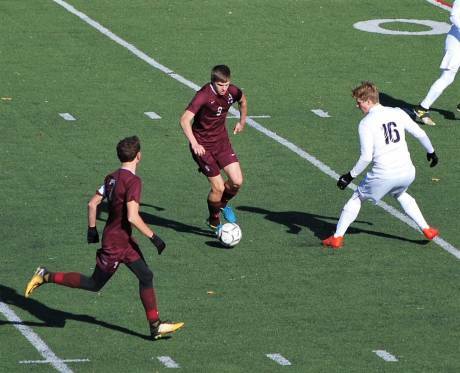 Four second-half goals propelled the Byron-Bergen/Elba Bees boys soccer team into the state finals as they beat Lake Placid in the Class C semifinals today, 4-0. The #1 ranked Bees play for the state championship tomorrow at 10:30 a.m. in Middleton. The Byron-Bergen/Elba Bees took on the Lake Placid Bombers for the NYS Class C Semi-Finals in Middletown, NY. 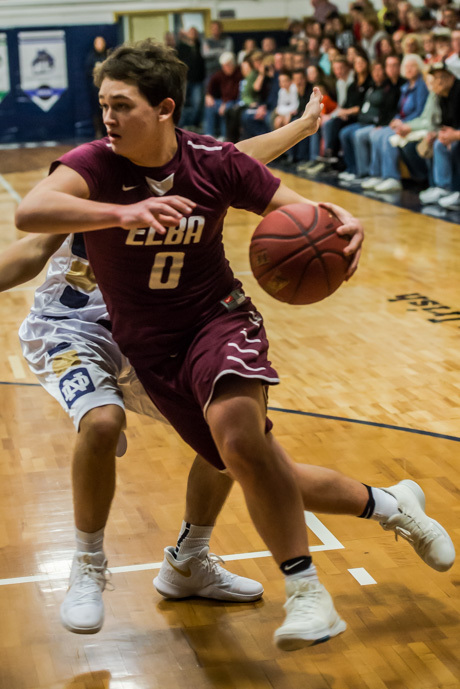 The BB/Elba team got off to a strong start with multiple scoring opportunities in the first half. 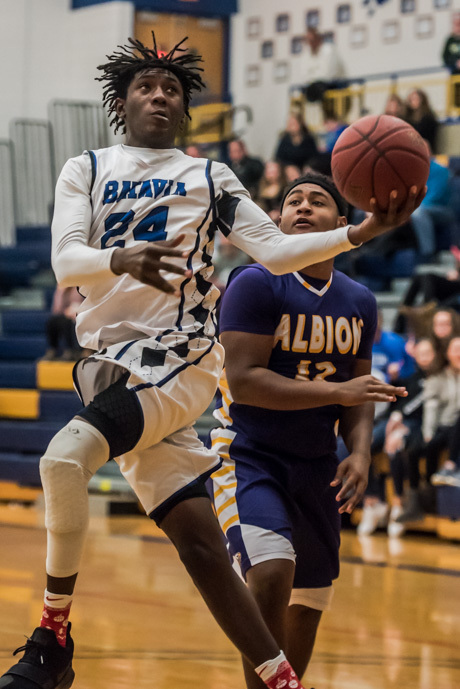 The Bombers withstood the BB/Elba attackers and the first half remained deadlocked at 0-0. 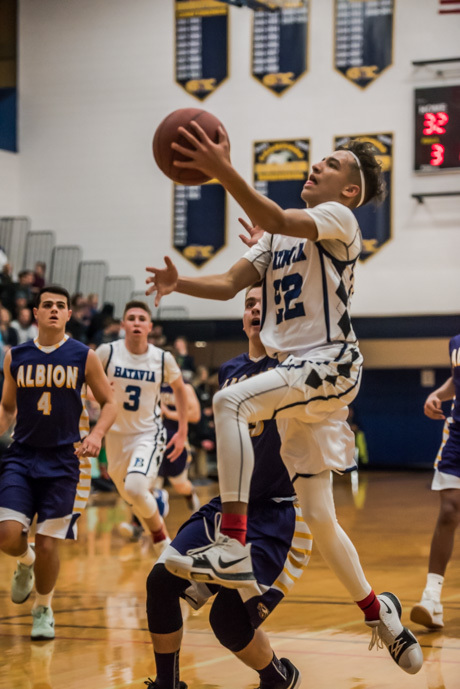 The BB/Elba team continued putting pressure on the Lake Placid defenders early in the second half. The Bees broke through the Bombers defense when Adam Swapceinski fed Kyle Foeller for the games first goal. But Swapceinski didn’t stop there and, within minutes, scored two goals of his own. 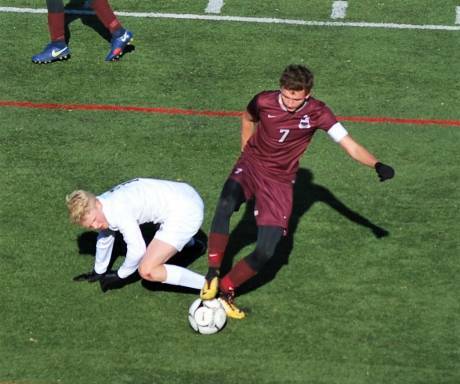 Late in the game, Wade Thompson beat multiple defenders before blasting a shot past the Lake Placid goalkeeper to put the Class C Semi-Final game out of reach. Bee’s goalkeeper, Brandon Kropf recorded his sixth shutout, in a row, in postseason play. The Byron-Bergen/Elba Bees play for the Class C State Championship on Sunday, Nov. 12, at 10:30 a.m. in Middletown, NY. A two-car collision is reported in Elba at South Main and Chapel streets. Elba fire police are called to the scene. No word on injuries. posted by Howard B. Owens in crime, batavia, elba, Pavilion, Le Roy, notify. Adam J. Gill, 29, of East Main Street, Batavia, is charged with DWI, two counts of burglary, and menacing, 2nd. At 1:31 a.m. Tuesday, Gill allegedly entered a residence in the Village of Elba and displayed a knife. After a brief struggle with the occupants, the intruder was disarmed and he left the residence without further incident. Gill was known to the residents. They did not sustain any injuries. Gill was located on Oak Street in Batavia and charged with DWI. He was jailed on $50,000 bail, $10,000 bond. Lamar Iteef Randall, 32, of Walnut Place, Batavia, is charged with aggravated unlicensed operation, 1st, obstructed license plate, and unlawful possession of marijuana. Randall was stopped at 4:35 p.m. Monday on Veterans Memorial Drive by Sgt. Ron Welker. Shaun Michael Brennan, 23, of Brookedge Drive, of Hamlin, is charged with DWI, refusal to breath test, and speeding. Brennan was stopped at 7:18 p.m. Monday on North Lake Road, Bergen, by Deputy Ryan DeLong. Jeremy John Schraufstetter, 40, of Leroy Street, Cheektowaga, is charged with felony DWI and felony driving with a BAC of .08 or greater. Schraufstetter was stopped at 1:43 a.m. Oct. 28 on Route 20, Darien, by Investigator Chris Parker. David S. Rigoni, 38, of Pavilion, is charged with operator impaired by drugs and moving from lane unsafely. Rigoni was stopped by State Police at 3:41 p.m. Tuesday in Le Roy. 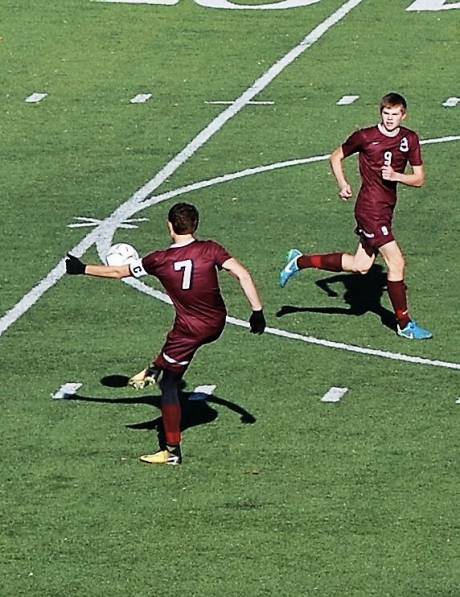 posted by Howard B. Owens in sports, soccer, byron-bergen, elba, news. The Byron-Bergen/Elba boys soccer team is 19-1-1, ranked #1 in the state and on the verge of playing for a Class C state championship. The captured a Section V title by beating Bishop Kearney in a second overtime period and then went on to win the Far West Regional title. 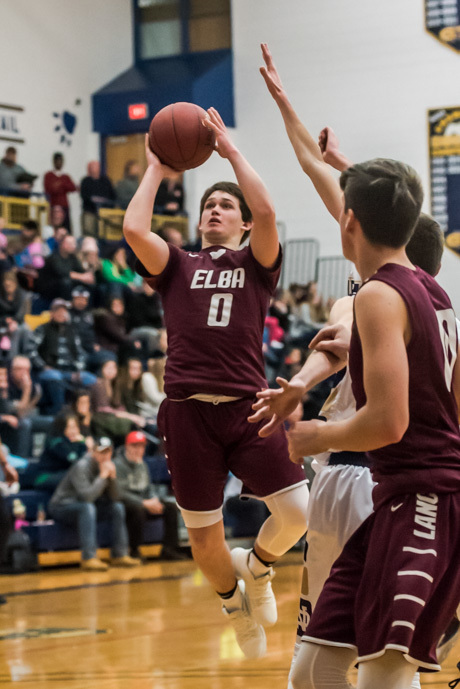 The Final Four begins at 1:30 p.m., Saturday in Middletown with B-B/Elba taking on Lake Placid. The finals will be played the following day in Middletown at 10:30 a.m.
Info and photos submitted by Robert Swapceinski. 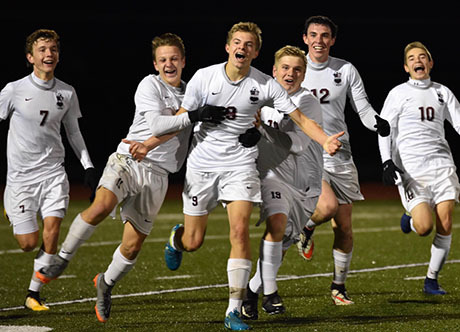 Top photo: Celebration after the sectional title. Adam Swapceinski, Greyson Huntington, Wade Thompson, Adam Drake, Kylar Chambry and Kyle Foeller. 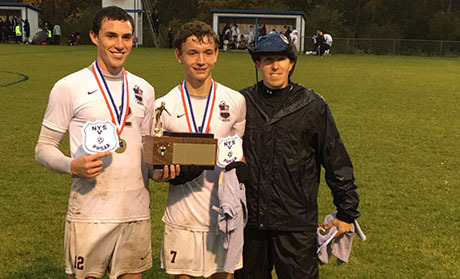 Captain Kylar Chambry, left, Captain Adam Swapceinski and Coach Ken Rogoyski. posted by Howard B. Owens in crime, batavia, pembroke, elba, Le Roy, Alabama, notify. Austin Lee Wester, 23, of Pratt Road, Batavia, is charged with criminal possession of a controlled substance and criminal use of drug paraphernalia. Police responded to the area of 21 Ross St., Batavia, at 11:13 a.m. Wednesday after a postal carrier reported observing a person who "appeared to be on something and suspicious." It was also reported that Wester walked around to the back of a residence and appeared to be casing the residence. He was jailed on $20,000 bail or $10,000 bond. Stacey Lynne Ives, 38, of Angling Road, Pembroke, is charged with DWI, driving with a BAC of .08 or greater, moving from lane unsafely, and unreasonable speed. Ives is accused of driving a vehicle that struck a parked semi-trailer in the area of 2200 Angling Road, Pembroke, at 3:06 a.m. Sunday. When deputies arrived on scene, Ives was reportedly out of the vehicle and walking around. She was treated at the scene by Mercy EMS and released with no reported injuries. The accident was investigated by Deputy Ryan Young. James M. Rossiter, 35, of Clifton Avenue, Batavia, is charged with DWI, driving with a BAC of .18 or greater, failure to signal, failure to use headlights, moving from lane unsafely. Rossiter was stopped at 1:04 a.m. Sunday on North Spruce Street, Batavia, by Officer Mitchell Cowen. Michael J. DiFalco, 29, no permanent address, is charged with petit larceny. DiFalco was arrested on a warrant for an alleged theft that occurred at 7:30 p.m. Sept. 24 at 41 S. Main St., Batavia. He was jailed on $5,000 bail or $10,000 bond. Danielle Elizabeth Cummings, 39, of Batavia Oakfield Townline Road, Batavia, was arrested on a warrant. Cummings was taken into custody at Wayne County Jail by Batavia PD and returned to the City of Batavia for arraignment in City Court. She was jailed on $2,500 bail. No information released on the charges contained in the warrant. Geoffrey M. Anderson Jr., 52, of Wood Street, Batavia, is charged with criminal trespass and second-degree harassment. Anderson was allegedly in a building at Batavia Middle School without authorization at 10:14 p.m. on Friday. While being escorted from the building, Anderson allegedly pulled away forcefully from a security aide and made threatening statements. Ryan N. Bartholomew, 23, of Adams Street, Batavia, is charged with disorderly conduct. Bartholomew is accused of directing obscene language at City of Batavia residents while in a vehicle in the area of 6 Orleans Ave., Batavia, at 3:44 a.m. Wednesday. Michael Charles Friedman, 60, of Quarry Hill Estates, Akron, is charged with DWI, driving with a BAC of .18 or higher, and possession of an open container in a vehicle. Friedman was stopped at 1:45 a.m., today, on Macomber Road, Alabama, by Deputy Mathew Clor. Daniel Edward King, 41, of Alleghany Road, Pembroke, is charged with criminal trespass, 3rd, disorderly conduct, and unlawful possession of marijuana. King allegedly returned to Batavia Downs at 5:37 p.m. Saturday after being told to leave, and using obscene language causing public alarm. He was jailed on $1,000 bail or $20,000 bond. Cindy M. Auberger, 54, of Keitel Road, Albion, is charged with felony DWI, drinking alcohol in a vehicle on a public highway, refusal to take a breath test, and unlawful of possession of marijuana. Auberger was allegedly found in a vehicle parked roadside at 12:37 a.m. Sunday on Clinton Street Road, Batavia, by Deputy Jenna Ferrando. John A. Petronio, 35, of Long Bridge Road, Albion, is charged with criminal possession of a weapon, 4th, and unlawful possession of marijuana. Petronio was allegedly found in possession of an electronic stun gun at 1:57 a.m. Friday at a location on Lake Street Road, Le Roy. Matthew Scott Williams, 29, of Hundredmark Road, Elba, is charged with petit larceny and auto stripping. Williams is accused of stealing catalytic converters from vehicles at a residence on Hundredmark Road, Elba. He is also charged with grand larceny, 4th, and falsifying business records, 1st. He is accused of selling a vehicle for scrap when he was not the owner of the vehicle had no night to sell the vehicle. He allegedly produced documents purporting to show he was the owner of the vehicle. The alleged theft was reported Sept. 28 on Clinton Street Road, Bergen. Minnie M. Henry, 29, of Batavia, is charged with petit larceny. Henry was arrested by State Police for an alleged theft reported at 3:33 p.m. Aug. 22 at a location in the Town of Batavia. No further details released.